City in the district of Jabal, Persia, situated on the Zendarud. The Jews pretend to have founded Ispahan, saying that it was built by the captives whom Nebuchadnezzar transported thither after he had taken Jerusalem. This tradition is related not only by Moses of Chorene (iii., ch. xxxv. ), but also by the Arabic geographers Ibn al-Faḳih (p. 261), Al-Iṣṭakhri (p. 198), Ibn Ḥauḳal (p. 261), Al-Muḳaddasi (p. 388), Yaḳut (i. 295, iv. 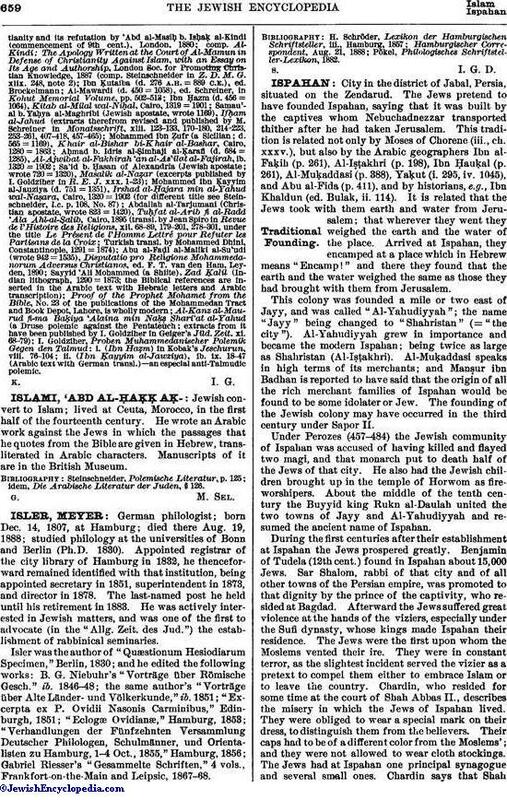 1045), and Abu al-Fida (p. 411), and by historians, e.g., Ibn Khaldun (ed. Bulak, ii. 114). It is related that the Jews took with them earth and water from Jerusalem; that wherever they went they weighed the earth and the water of the place. Arrived at Ispahan, they encamped at a place which in Hebrew means "Encamp!" and there they found that the earth and the water weighed the same as those they had brought with them from Jerusalem. This colony was founded a mile or two east of Jayy, and was called "Al-Yahudiyyah"; the name "Jayy" being changed to "Shahristan" (= "the city"). Al-Yahudiyyah grew in importance and became the modern Ispahan; being twice as large as Shahristan (Al-Iṣṭakhri). Al-Muḳaddasi speaks in high terms of its merchants; and Manṣur ibn Badhan is reported to have said that the origin of all the rich merchant families of Ispahan would be found to be some idolater or Jew. The founding of the Jewish colony may have occurred in the third century under Sapor II. Under Perozes (457-484) the Jewish community of Ispahan was accused of having killed and flayed two magi, and that monarch put to death half of the Jews of that city. He also had the Jewish children brought up in the temple of Horwom as fire-worshipers. About the middle of the tenth century the Buyyid king Rukn al-Daulah united the two towns of Jayy and Al-Yahudiyyah and resumed the ancient name of Ispahan. During the first centuries after their establishment at Ispahan the Jews prospered greatly. Benjamin of Tudela (12th cent.) 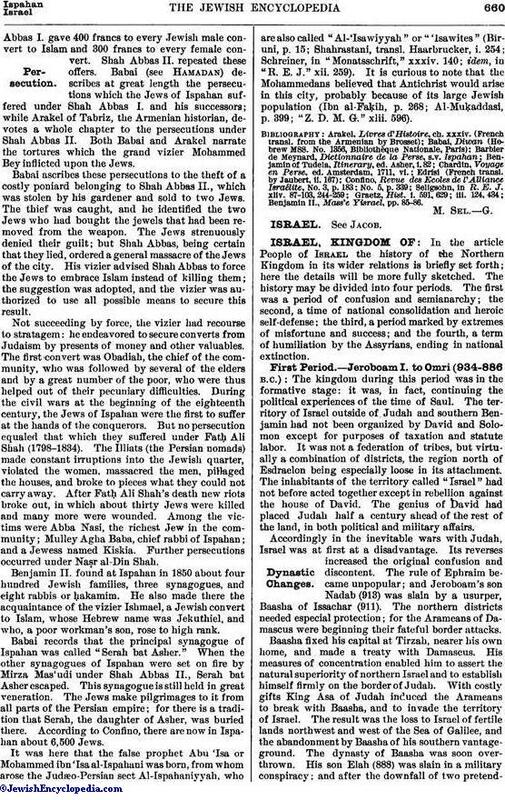 found in Ispahan about 15,000 Jews. Sar Shalom, rabbi of that city and of all other towns of the Persian empire, was promoted to that dignity by the prince of the captivity, who resided at Bagdad. Afterward the Jews suffered great violence at the hands of the viziers, especially under the Sufi dynasty, whose kings made Ispahan their residence. The Jews were the first upon whom the Moslems vented their ire. They were in constant terror, as the slightest incident served the vizier as a pretext to compel them either to embrace Islam or to leave the country. Chardin, who resided for some time at the court of Shah Abbas II., describes the misery in which the Jews of Ispahan lived. They were obliged to wear a special mark on their dress, to distinguish them from the believers. Their caps had to be of a different color from the Moslems'; and they were not allowed to wear cloth stockings. The Jews had at Ispahan one principal synagogue and several small ones. Chardin says that ShahAbbas I. gave 400 francs to every Jewish male convert to Islam and 300 francs to every female convert. Shah Abbas II. repeated these offers. Babai (see Hamadan) describes at great length the persecutions which the Jews of Ispahan suffered under Shah Abbas I. and his successors; while Arakel of Tabriz, the Armenian historian, devotes a whole chapter to the persecutions under Shah Abbas II. Both Babai and Arakel narrate the tortures which the grand vizier Mohammed Bey inflicted upon the Jews. Babai ascribes these persecutions to the theft of a costly poniard belonging to Shah Abbas II., which was stolen by his gardener and sold to two Jews. The thief was caught, and he identified the two Jews who had bought the jewels that had been removed from the weapon. The Jews strenuously denied their guilt; but Shah Abbas, being certain that they lied, ordered a general massacre of the Jews of the city. His vizier advised Shah Abbas to force the Jews to embrace Islam instead of killing them; the suggestion was adopted, and the vizier was authorized to use all possible means to secure this result. Not succeeding by force, the vizier had recourse to stratagem: he endeavored to secure converts from Judaism by presents of money and other valuables. The first-convert was Obadiah, the chief of the community, who was followed by several of the elders and by a great number of the poor, who were thus helped out of their pecuniary difficulties. During the civil wars at the beginning of the eighteenth century, the Jews of Ispahan were the first to suffer at the hands of the conquerors. But no persecution equaled that which they suffered under Fatḥ Ali Shah (1798-1834). The Illiats (the Persian nomads) made constant irruptions into the Jewish quarter, violated the women, massacred the men, pillaged the houses, and broke to pieces what they could not carry away. After Fatḥ Ali Shah's death new riots broke out, in which about thirty Jews were killed and many more were wounded. Among the victims were Abba Nasi, the richest Jew in the community; Mulley Agha Baba, chief rabbi of Ispahan; and a Jewess named Kiskia. Further persecutions occurred under Naṣr al-Din Shah. Benjamin II. found at Ispahan in 1850 about four hundred Jewish families, three synagogues, and eight rabbis or ḥakamim. He also made there the acquaintance of the vizier Ishmael, a Jewish convert to Islam, whose Hebrew name was Jekuthiel, and who, a poor workman's son, rose to high rank. Babai records that the principal synagogue of Ispahan was called "Serah bat Asher." When the other synagogues of Ispahan were set on fire by Mirza Mas'udi under Shah Abbas II., Serah bat Asher escaped. This synagogue is still held in great veneration. The Jews make pilgrimages to it from all parts of the Persian empire; for there is a tradition that Serah, the daughter of Asher, was buried there. According to Confino, there are now in Ispahan about 6,500 Jews. It was here that the false prophet Abu 'Isa or Mohammed ibn 'Isa al-Ispahani was born, from whom arose the Judæo-Persian sect Al-Ispahaniyyah, who are also called "Al-'Isawiyyah" or "'Isawites" (Biruni, p. 15; Shahrastani, transl. Haarbrucker, i. 254; Schreiner, in "Monatsschrift," xxxiv. 140; idem, in "R. E. J." xii. 259). It is curious to note that the Mohammedans believed that Antichrist would arise in this city, probably because of its large Jewish population (Ibn al-Faḳih, p. 268; Al-Muḳaddasi, p. 399; "Z. D. M. G." xlii. 596). Benjamin II., Mass'e Yisrael, pp. 85-86.